EMUC2806 is a shorter cable (6″) with a 28 pin chip socket. It is useful for situations where there is interference with the standard length cable. EMUC3206 is a short (6″) cable with a 32 pin chip socket. When used with an Ostrich2 it allows emulation of a 29F040 4Mbit EPROM. Adapters can be used to change this to PLCC or other formats. This cable is NOT compatible with the Ostrich 1, APU1 or ChipExtender – Ostrich2 ONLY! EMUC2836 is an extra-long (36″) cable with a 28 pin chip socket. It is NOT for use with emulators. This cable is only intended to be used with the ChipExtender product we sell. Unpredictable results can happen when used with emulators. The RoadRunner uses an alternative emulation cable which is incompatible with other devices. The Ostrich, Ostrich 2 and APU1 all use the same emulation cables. These cables have a 0.1″ pitch rectangular connector on one end. 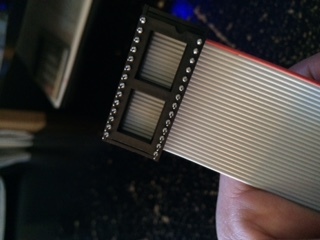 On the other end, a male chip connector is crimped. 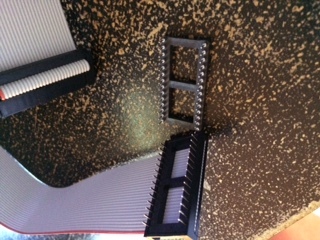 Before shipping the cable, we install a machined-pin socket on the cable to protect the more fragile chip connector. Replacing a MP socket is much easier and cheaper than replacing a whole emulation cable! The roadrunner uses unique cables designed to connect RR hardware with a soldered-on POSOP44 pin header. Typically, two of these cables must be connected back-to-back for proper operation.